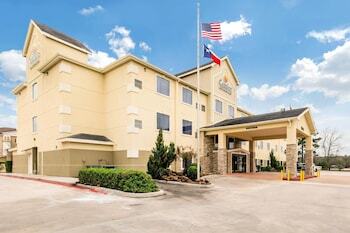 Located in Humble, Comfort Inn & Suites IAH Bush Airport – East is within a 5-minute drive of Humble Civic Center and Schott Park. Featured amenities include complimentary wired Internet access, a 24-hour business center, and limo/town car service. Planning an event in Humble? This hotel has 950 square feet (86 square meters) of space consisting of a conference center and a meeting room. A roundtrip airport shuttle is complimentary at scheduled times. With a stay at Rodeway Inn And Suites Medical, you'll be centrally located in Houston, convenient to Houston Maritime Museum and Houston Zoo.